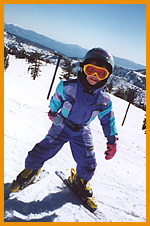 Hailey had been on skis before, but she really didn’t know how to stop, turn, or even get in and out of her bindings. But after a season on her Heads, she is linking turns, plowing through all kinds of conditions and even working on keep her skis like French Fries. Functionality of Product: The Head Carve skis worked very well. The edges were tough to stand up to the abuse of kids playing around. We were very impressed at how well they carved for such a little person. When they were on edge, Hailey linked some beautiful carved turns. This just isn’t possible with straight skis. The bindings worked well, but were a little bit stiff as Hailey had to sit way back to clamp her foot down. The boots were very functional and very comfortable. Hailey could even buckle her own boots (with only one buckle, it makes it that much easier). The boots have a clear window to “watch your size” which we really didn’t use. You can look in to see if the foot is close to the edge, but with wiggling feet, dark sock and the usual whining, it wasn’t worth it. The boot fit a little bit wide for Hailey’s narrow feet, so we added a footbed and some padding around the instep. This worked quite well. How it is made: The Head products are made very well. The skis are scratched up on the upper surface, but the bases have held up very well considering the kids tried skiing the concrete deck one day. The boot soles look very good and should hold up for a least a couple of more seasons (great for siblings). 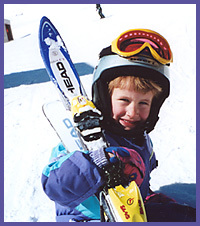 Use: Hailey goes skiing two or three afternoons a week in all types of conditions. She loves the Mountain Run at Squaw and even gets into the terrain park. During a snow storm we even built some little jumps in our yard and got air! Performance: Hailey has definitely improved this year. She went from a very stiff wedge to carving wide track parallel turns. She can turn on a dime and the skis carve better than any little skis we have seen. No complaints about her feet mean that we can stay out longer (and maximize that lift ticket). The boot also had a very soft flex which is so important to little ones. She wasn’t in the back seat at all and was able to keep weight forward for easier carving. Compared to the little rear entry boots, these boots are far superior for forward flex. Cool Factor: Heads are pretty cool. Hailey liked the graphics. She had a few concerns about the boots. They were black with yellow trim. Not too sharp for a little girl who is so fashion conscious. They do come in other colors though. She worried that none of the other kids in Mighty Mites had Head boots (lots of hand me down rear entries) until she saw the rental fleet at Beaver Creek which had all Head boots! For more info on Head see our Rippin’ Rider Preview here.